Save your back and lift that heavy anchor with the push of a button! You love to fish. You hate pulling in the anchor. We all do. But there's a solution. 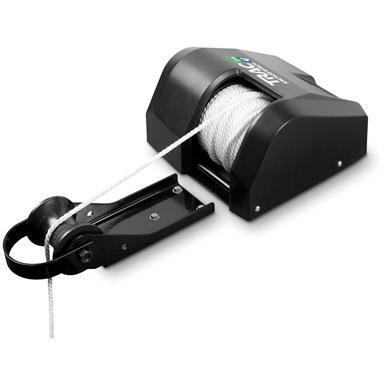 Install the Trac Fisherman 25 Electric Anchor Winch and lift that anchor with the push of a button. The Trac Fisherman 25 Electric Anchor Winch delivers quick, controlled retrieval of anchors up to 25 lbs. Its high-efficiency 12V DC gear motor uses less battery power than others, and it features an anti-reverse internal clutch to prevent free-spooling. Installation is easy, too. Save your back and make your day on the water more enjoyable! Order yours today! Maximum Anchor Capacity: 20 - 25 lbs. Winch Dimensions: 19.5" x 9.75" x 5.75"h.
Davit Dimensions: 9.5″ x 3.5″ x 5″h.